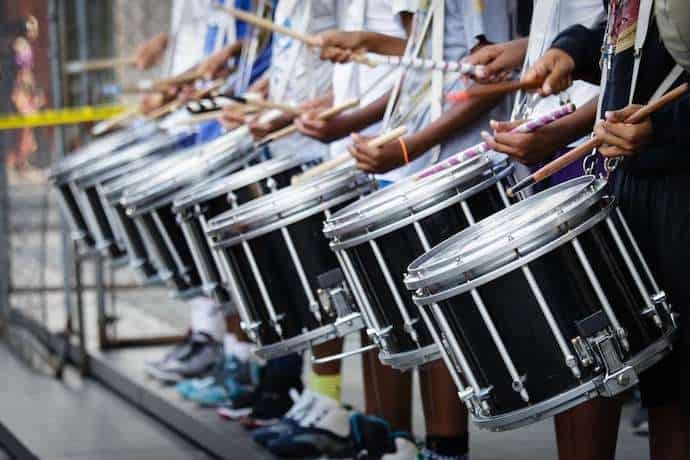 Every so often, young drummers might get their first interaction with these musical instruments while trying out for a marching band. Although having to play just one piece of a larger ensemble may seem easy, there’s a lot of skill and gearing required to sound good and deliver an impactful performance. For marching percussionists, it all starts with the sticks. The snare sticks used are not the same as what you may see in the hands of a concert drummer. They have different lengths, diameters, and a variety of tip styles and tapper designs, each adding its own pros and cons. If you’re unsure about what you will be required to play in the near future and what sticks are best for you, check out my favorite picks and learn what each of them has to offer. Stick Size – How Much Does this Matter? These are heavy yet powerful sticks designed to make you stand out. Barrel tips will give you the best punch and that’s exactly what you get with the Ralph Hardimon Signature snare sticks. The long taper is an acquired taste. It offers a lot of control at the expense of some power. The combination of barrel tip and long taper balances each other’s drawbacks and allows you to get the best of both worlds: speed control and raw power. When it comes to handling, the sticks are ideal for experienced percussionists. The 17” length is pretty much the industry standard and the .710” diameter allows for a solid grip and natural wrist movements. Designed by Scott Johnson drum corps legend, these marching band drum sticks are the embodiment of classic feel at an affordable cost. I like the combination of medium taper and ball tip as it provides the most versatility. These sticks are not just good for experienced drummers but also for inexperienced percussionists that haven’t found their sound just yet. The responsiveness is good and the balance is impressive for 17” sticks. The tip facilitates a robust sound while the .700” diameter ensures quick responsiveness and good control. These sticks are made of hickory wood which is able to withstand extended use in a variety of outdoor conditions. The MS5 snare sticks offer an interesting combination. They feature a .705” diameter, slightly bigger than most sticks in the Corpsmaster series, and a medium taper. This should achieve a decent balance between control and power/punch. The sticks are made of hickory which guarantees reliability in outdoor settings. The feel is smooth and allows the users to hold the sticks with comfort and confidence. This is also where the medium tapper comes in handy as it provides superior control over a short tapper, even if it comes at the cost of some volume. 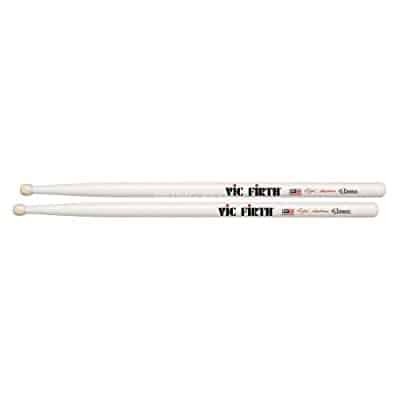 Of course, it’s the reliability of Vic Firth music gear that seals the deal on the MS5 snare sticks. Made from heartwood hickory, the FS1 marching sticks are an example of durability and reliability. They have an average thickness (.698” diameter) and a short taper, both of which promote a quick response. The oval tip will give you a balanced tone. It’s almost neutral as it won’t favor the low end or the natural brightness of marching snare drums. It’s not a popular tip style but it is very suitable for practice and for anyone that doesn’t hold a lead position. The control is great due to the balance of the stick. The 17” length doesn’t put too much weight on the front end, which means you could get a perfect rebound even with complex rhythms. Although the oval tip is not the most popular design, it’s a good choice for anyone that wants a more balanced response. If you’re not leaning towards a quick response or maximum volume, the oval tip might be the way to go. The medium tapper is all about neutral and balanced sound, which is what makes these sticks great for entry-level and experienced percussionists. They’re also highly useful if you prefer to blend in rather than take center stage in a band. 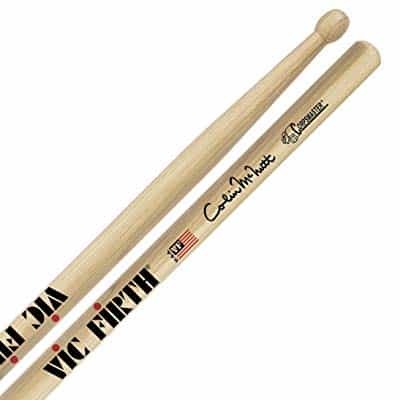 The length is a standard 17”, but the diameter is slightly smaller than some of the other models in Vic Firth’s Corpsmaster series. The .690” diameter leaves you with lighter sticks which are easier to control. These are probably your best choice if you need to execute complex rhythms and fills and also to stand out with a bright tone. 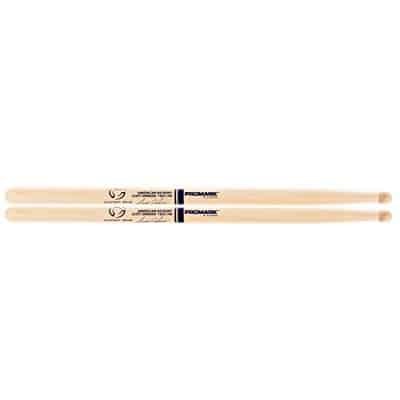 Marching percussion sticks require a different level of durability than regular drum sticks. Almost exclusively used outdoors, these sticks must endure sun, rain, humid environments, and a whole host of elements that can quickly affect the integrity of the wood as well as ruin the percussionist’s ability to handle complex rhythmic lines. There’s a lot of variety in tip styles. Of the five currently in use, three are the most common in marching bands. Teardrop tips let you create a warmer tone by compensating the already bright sound of marching snare drums. Ball tips have great articulation and enhance the crispness of the snare tone. Barrel tips are used to get the most punch and volume out of the snare drum. It comes down to skill level and personal preference when choosing a tip style for your sticks. Size refers to both length and thickness. Each feature impacts the playing style and sound in different ways. Thicker sticks can give you more projection but the sound will likely be less crisp. They’re also somewhat harder to control. In contrast, thinner sticks allow you to play faster and produce a brighter tone. They’re more suitable for complex lines, fills, rolls. However, they also don’t last nearly as long. The length can affect the sound as well but more in the way that it affects the feel. Longer sticks will be front heavy, which may make it harder to control the clarity of soft notes. Shorter sticks, on the other hand, don’t pack enough power because they lack leverage and may require a higher skill level to use effectively. As you can see, to the untrained eye all marching sticks may look and feel the same. But, upon closer inspection, it’s the tiniest of differences that separates these sticks. Each set of snare sticks on this list excels in at least one or two areas. But, no matter how well you’re geared for the occasion, no amount of craftsmanship and balance can substitute technique. Are you ready to take your commitment to the next level?